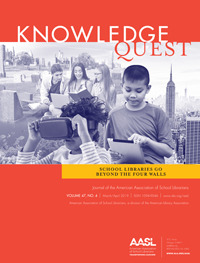 Home › Blog Topics › How Can School Librarians Teach Media Literacy in Today’s Highly Charged Media Landscape? I have been thinking quite a bit about media literacy for a long time now, and I have noticed that my training and career as a school librarian have really impacted how I consume media. I’m not able to casually listen to news on the radio, view a political ad on television, see a billboard, or hear a coworker discuss the day’s events without filtering those messages through several lenses, most notably the CRAAP detector I most often taught my middle and high school students. Currency, Reliability, Authority, Accuracy, and Purpose are still my go-to means of determining the value of a particular piece of media, and I continually consider each aspect of media messages unconsciously as I move through my day. Our students are bombarded with an onslaught of information and news on a daily basis. They are acutely aware of injustice, persecution, civil unrest, and other societal ills, and this awareness cannot be ignored or discounted by school librarians and other educators. We must equip our students to deal with media messages and to learn from them. So what is a well-meaning school librarian to do? How can we keep ourselves engaged in this challenging media landscape, while guiding our students (and sometimes, colleagues as well) toward responsible consumption, sharing, and production of media? How do we approach this often emotionally charged, contentious subject in our school libraries and classrooms? Finally, how do we take control of our emotional responses to the media we are bombarded with every day? I have a few ideas, none of which are very original, but all have helped me in dealing with these questions in my own practice and my personal life. 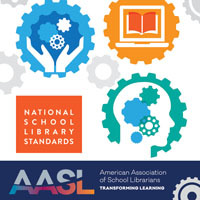 We are also lucky to have new National School Library Standards for Learners, School Librarians, and School Libraries to help us find our way in this admittedly bizarre media environment. I wrote about this extensively in the September/October issue of Knowledge Quest. Media Bias Chart 4.0: What’s New. Source: https://www.adfontesmedia.com/ (accessed October 18, 2018). This is a fair amount of work, and I admit that I do not fact-check everything I read, view, or hear. I do, however, quickly link a Snopes article to egregious claims I come across on social media. This engagement in the overall media landscape keeps me grounded, and helps me see that situations arising each week are not as dire as either political camp makes them out to be. I’m happier for it, I believe. When I was a high school librarian, I encouraged my students to do the same; fact check and politely refute claims their acquaintances share on social media as a means of social activism. Know your audience. If you have lived in your community for several years and have been in your position for a while, then you likely have a good sense of where their political leanings are. If not, or if you are unsure, tread lightly. Start with history. You can teach media literacy using Yellow Journalism and the Spanish-American War, propaganda via WWII, and social justice concepts through the struggle for civil rights in the US. The separation of time can often be less triggering for partisans. Leave your beliefs at the door. 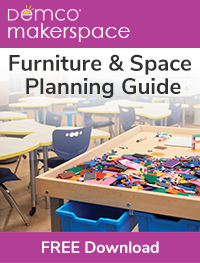 Present objective facts, toolkits, and concrete steps for teachers and students to follow as you teach your lessons. If you’re providing examples of sensationalized news reporting, get examples from both sides of the political spectrum. There is no shortage of bad “journalism” on either end. Again, the chart above can be a helpful tool in discovering sketchy reporting. Teach civil discourse. Work with the teachers you’re partnering with to explicitly teach argument in class. Model appropriate voice registers, language, adherence to the rules of debate, and decorum when discussing these topics, and respectfully hold each other and students accountable for words and actions. Some classes are simply not ready to have discussions on particularly emotionally charged topics. Be prepared to tactfully end a discussion before it has a chance to escalate. Be on the lookout for heated debates in your school library as well; students, staff, and your community should feel safe in sharing their viewpoints in what should be a neutral space. Teaching media literacy, and the emotions these lessons can trigger, especially in this political climate, are not topics for everyone. You will need to carefully consider whether you are prepared to tackle some of these issues in your school. I recommend reviewing Dr. Joyce Valenza’s blog post on “Truth, Truthiness, Triangulation: A News Literacy Toolkit for a “Post-Truth” World” where she shares the case for teaching these skills, and provides a wealth of information and tools for getting this messy and much-needed work done. As far as keeping ourselves grounded and capable of rationally examining many sides of emotionally charged issues, it becomes vital for us to practice self-care as educators. I was fortunate to hear Kristin McKeown discuss mindfulness at a professional development session the Educational Technology and Library Services Department at our district put on a few weeks ago on on this very topic. She emphasized many aspects of self-care, and the one that resonated the strongest with me was all about not beating ourselves up every day on the choices we make in our work lives. Choosing to tackle media literacy using contentious current events is not for everyone, and I argue that we can still be effective educators if we teach media literacy using some of the more historical approaches above, while continually working with our students, staff, and communities on becoming practitioners of civil discourse and creating safe spaces where everyone feels free to express, debate, and change their views, regardless of their ideological affiliations. School librarians can and should take on this work; it is vital to our future as a society. McKeown, Kristin. “Why Teachers Need to be ‘Warm Demanders’ Toward Themselves”. https://www.teachingbalance.com/blog/why-teachers-need-to-be-warm-demanders-toward-themselves. Accessed October 19, 2018. CRAAP Test”. csuchico.edu. September 17, 2010, http://www.csuchico.edu/lins/handouts/eval_websites.pdf. Accessed October 18, 2018.
https://www.adfontesmedia.com/wp-content/uploads/2018/08/Media-Bias-Chart_4.0_8_28_2018-min.jpg. Accessed October 18, 2018. Valenza, Joyce. “Truth, Truthiness, Triangulation: A news literacy toolkit for a “post truth” world. blogs.slj.com. November 26, 2016, http://blogs.slj.com/neverendingsearch/2016/11/26/truth-truthiness-triangulation-and-the-librarian-way-a-news-literacy-toolkit-for-a-post-truth-world/. Accessed October 18, 2018. That was a good read. I found that most of my go-to sources tend to be neutral or just leaning to either side: Reuters, NPR, Washington Post, NYT, and WSJ. AASL probably doesn’t care but Vanessa Otero is a self-proclaimed liberal. This chart shared here is her opinion. Thank you for your post, Len, and for sharing this chart, media literacy teaching tips, and other resources. One way this chart (created by a “liberal” woman) could be used is for students to take a political incident (a set of facts) and examine the reporting from these publications to determine where they (the students) would put these publications on such a continuum based on their reading and critical analysis. Of course, they would first have to have a shared definition for “left” and “right” and all the shades in between. Then they could compare their chart with Vanessa Otero’s. I suspect students could then create a number of essential questions about the nature of truth and news reporting today that could result in deep inquiry learning. Side note: Do you ever wonder if there is truly a “neutral” person/news source in the world today? I recently taught a leason on evaluating information for authority and bias and used the same chart. My principal and I recieved complaints from a few parents who felt that the chart was too political and was also biased. I ended up using the chart anyway, accompanied by a few similar tools and talking to students about how judging bias is also influenced by bias. Tough stuff, but important. Kudos to you for taking on a tough lesson with your learners! It is often hard to hear complaints from parents and others when we do the often messy work of unpacking and examining our biases, and you are right – it is important work. I hope your principal values creating safe spaces for teaching & learning and supported your instruction. Please let me know if I can help in any way! First of all – thank you for your effort. Second, I find a tremendously important consideration missing here is coverage bias. The very types of topics researched and reported on is biased. Not just media but original research sponsored at universitiies and publishers are left leaning. If you are a conservative the topics you think are important might have, for example, five outdated sources and if you are a liberal, you might find two hundred sources on a favorite topic and they are thoroughly researched because they come from an organization like the New York Times or Washington Post. Look at the coverage bias on a topic like global warming/climate change or the impending impeachment of President Trump. It’s not even close. 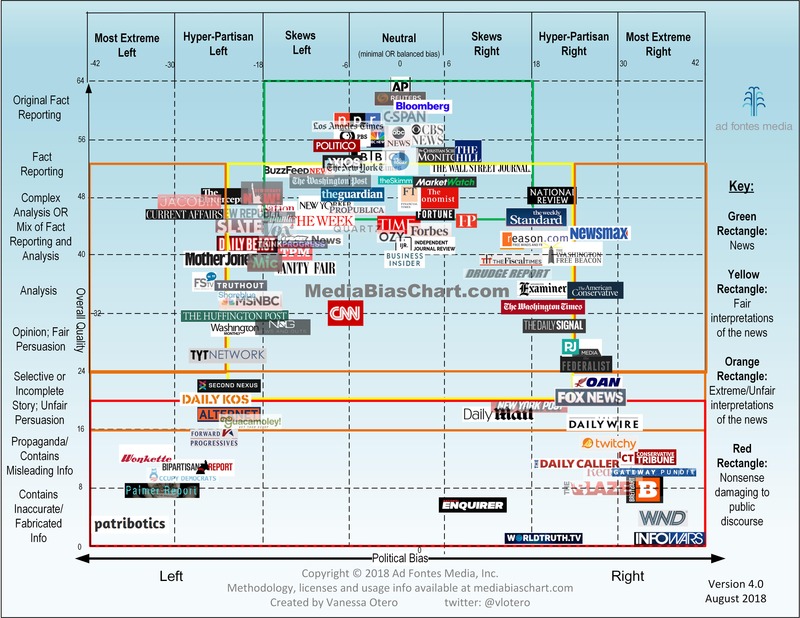 Secondly, the chart on media bias you cited has never been verified for accuracy. It lists NPR and Time magazine as being neutral. Ask a rough sampling of conservative readers if they agree with this chart and be prepared for some push back.